- Optimized proportion of WC particles and Co binders for each workpiece material provides improved resistance to chipping and wear. - The ultrafine structure which has been made uniform attains stable machinability at all corners. Non-ferrous metals such as aluminum and copper have relatively low melting points, causing heavy welding on the tool edges during machining. The dulled cutting edges bring about poor suface finish of workpieces while high cutting load increases the chance of sudden chipping, resulting in unstable tool life. To provide our customers with a satisfactory grade solution for non-ferrous metal machining, KORLOY has developed DLC (Diamond-Like Carbon) coated grades. PD1005 is a grade for workpieces made of aluminum or copper, and for continuous cutting. The latest DLC coating with maximized wear and welding resistance enables high speed machining for those materials, delivering excellent surface finish in continuous cutting of general non-ferrous metals. PD1010 is a grade for workpieces made of forged aluminum or AlSi alloy, and for interrupted cutting. 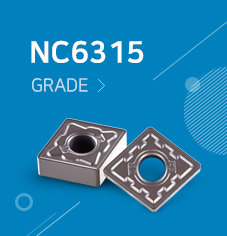 The combination of the chipping-resistant substrate and DLC coating greatly improves toughness, providing stable and long tool life in interrupted cutting or when machining nonferrous metals of high hardness.